The man thought to be the Islamic State (IS, formerly ISIS/ISIL) executioner known as “Jihadi John” was filmed by an Australian news channel condemning British police during the London 2011 riots. The footage, from Australia’s Channel Nine, shows Abdel Majed Abdel Bary in Tottenham on the first night of the riots, becoming increasingly irate about the behavior of the Metropolitan Police. The 23-year-old rapper can be seen interrupting live interviews with other bystanders. “The police are protecting the police. They are not protecting the people. They are protecting the police,” he tells reporter Peter Stefanovic. 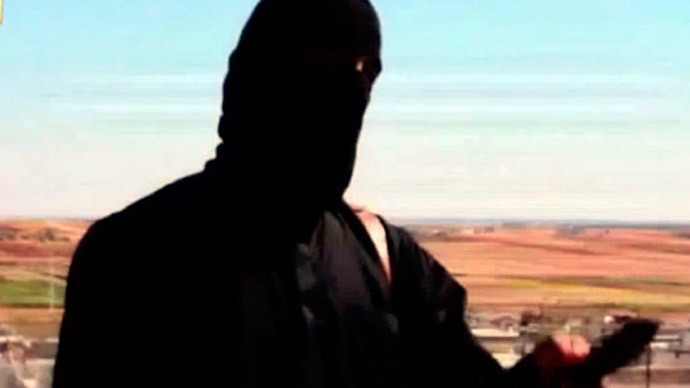 “Jihadi John,” whose identity has not been ‘officially’ confirmed by authorities, has reportedly presided over the public execution of five westerners, including British aid workers David Haines and Alan Henning. More recently he is believed to have featured in a video released on Sunday depicting the murder of US aid worker Peter Kassig. On Monday, French Interior Minister Bernard Cazeneuve said they had also identified French-born extremist Maxime Hauchard at the execution. Authorities believe other British extremists were involved in some or all of the beheadings. British intelligence initially suspected Bary to be the man behind the mask of “Jihadi John” but later revised their assessment. They are yet to ‘officially’ name a suspect. Bary, originally from Maida Vale in West London, is believed to have traveled to Syria in 2013 after quitting his music career. The discovery of the London riots footage coincides with speculation that “Jihadi John” was wounded in a joint US-Iraqi airstrike. The Foreign Office affirmed they had received information that a man on their most wanted list had been injured in a town close to the Syrian border nearly a week ago. The Islamic State leader Abu Bakr al-Baghdadi was also reportedly wounded in the attack by American and Iraqi jets on a summit of IS leaders. The IS executioner known as “Jihadi John” is one of the world’s most wanted men – and now it has emerged that 9NEWS reporter Peter Stefanovic may have had a close encounter with him on the streets of London during the 2011 riots.